A "simplicity of detail" coupled with the "versatility to design both handsome modern and elegant traditional spaces" are the keys to Gleicher Design's success, references report. 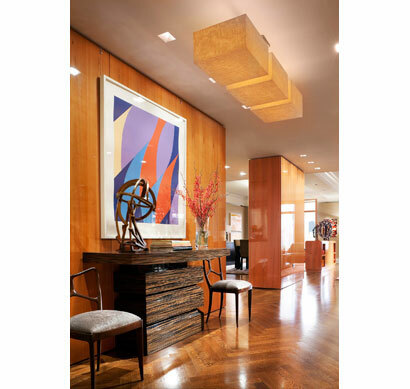 They tell us that the firm excels in gut renovations of apartments and townhouses on the Upper East and Upper West Sides, but also takes on new homes and additions. Principal Paul Gleicher's "honest," "thoughtful" and "involved" approach to design is just one of many reasons clients have returned for other projects. Additionally, sources speak of Gleicher's soothing personality, and how he is able to take the stress out of any situation with his positive outlook. This firm of four was created in 1989 by sole principal Paul Gleicher after he spent time at Davis Brody & Associates and Haverson/Rockwell Architects. He holds an M.Arch. from Columbia and is both a LEED Accredited Professional and a Certified Passive House Designer. Gleicher and his associates average about ten new projects each year, most of which are in and around the city. There are in-house experts on zoning issues and environmentally friendly, energy-efficient design. Gleicher has partnered with Good Housekeeping for a feature entitled "How to Renovate Responsibly," showcasing a house with a green roof; he has also appeared on Good Morning America to discuss green design issues. Along with his wife, Lisa Sharkey, Gleicher co-authored Dreaming Green: Eco-Fabulous Homes Designed to Inspire. In it, the couple describes their own green townhouse renovation, as well as sixteen other green homes across the country. Gleicher Design has worked with numerous celebrity clients and has a full-time design associate available for interior design work. The firm charges a standard percentage of overall construction costs. Clients appreciate the fact that Gleicher "works really hard to make intelligent economic choices." "He's just got an extraordinary gift for a brand of modern design that is warm and rich without being austere." "The design team has great chemistry." "Their modern style often has a clean, Japanese flair to it which makes it so interesting." "Paul is very reasonable, easygoing and wants to please." "Able to take our abstract vision on how we wanted our apartment to look and make it a reality." "Could have used a bit more coordination and planning on the integration of the surfaces and appliances." "His judgment and taste are terrific, and his integrity is of the highest order." "The weekly meetings were run professionally." "Very disciplined approach." "He gave us great economic options, and although we usually went for the more expensive version, you always felt he was happy to go either way." "Great help in getting us the best contractor for the job." "Moving from Manhattan to Westchester was daunting, but they understood what we wanted even when we couldn't articulate it." "Got what we wanted and more." "I would use him again in a heartbeat."